When planning or designing a patio area, there are a number of factors to consider, including the position, size and shape, pattern and building materials. If you don’t have much experience with hard landscaping, you may be better getting touch with a landscape gardener to do the job for you, or at least to help with he design and planning. You can use the “post a Job” page on this site to get in touch with local landscape gardeners for quotes and advice completely free. Adding a patio to your garden can take a number of forms, everything from a simple paved area directly outside the house, to a fabulous Mediterranean-style outdoor living space, or somewhere in between. Whatever type of patio you are planning, the first thing to think about is the position. To decide on the best place to site your patio, you need to consider when you are most likely to use it, then choose the part of your garden that will catch the sun at that time. That is if you are a sun lover of course, alternatively you may want to avoid the sun and choose a shady area where you relax and stay cool in the summer. Privacy is another factor to consider, most prefer their patio to be enclosed by walls, screens or even tall plants. In addition, a sheltered, private area will also provide security for any garden furniture left out. 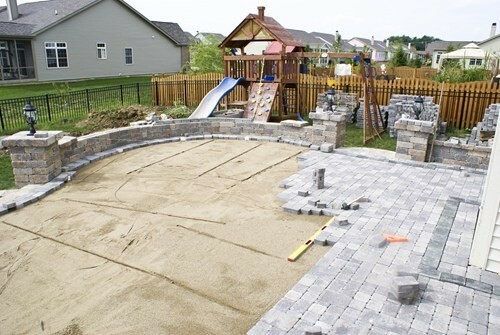 When considering the right size for the planned patio, it all depends on the intended use. For example, if you plan on using your patio as a dining area, make sure there is enough space for the table and chairs plus room to move the chairs away from the table; or if including a barbecue or fire pit, ensure you leave enough space to avoid guests being roasted! The shape of the patio area can be anything you like, but bear in mind a rectangular patio is easier when it comes to laying slabs, but if you think a curved area may suit the garden better, you need to consider what materials you can use to create that shape. There are a range of attractive and easy to lay circular or semi-circular patio paving kits available form your local garden centre or builders’ merchant, but they are more expensive than traditional paving. Choosing the right material and pattern to lay it is a difficult choice for any patio. There are so many options available, it can be tricky making the right decision. Plus of course even if you really like a particular material, you have to balance your decisions with your available budget.